That's quite a compliment, and at time of writing was meant to be one. There's nothing quite as good as a slice of homemade apple pie, still warm with a flaky crust and a scoop of ice cream (usually vanilla) on the side. It conjures happy memories of "home" to many people. There are many versions of apple pie floating around on the inter-web, not to mention in cookbooks. So it can be a little confusing as to which recipe to choose. Many newer pies are a variation on the old tried and true recipe. I prefer the old time recipes. There's a reason they've lasted so long. It's because they're good. 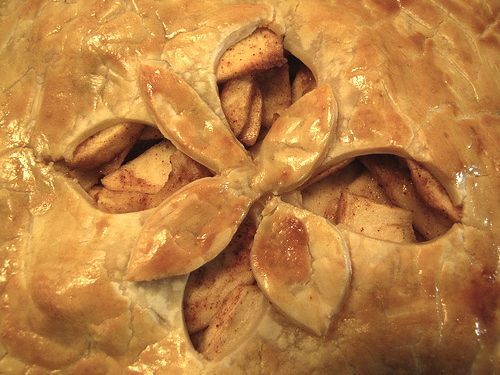 Apples have been baked in pastry for centuries. In the 13th century, published recipes show that they did not contain sugar. It was an expensive commodity. The crust was not to be eaten, as it was more of a vehicle to bake in, as opposed to being part of the dessert. Many meat dishes also used a pastry case that was discarded. By the 1500, sugar had become more available and the pastry had changed into part of the whole dessert. The early American colonists brought their favourite apple varieties with them as the only apples they found growing natively were more of a crab apple variety and unfit for pies. By the early 1800s, with the proliferation of somewhat more affordable books, published recipes began to appear in cookbooks that people could afford. Publication meant that recipes could spread more quickly and easily. This also led to standard methods of making apple pie. 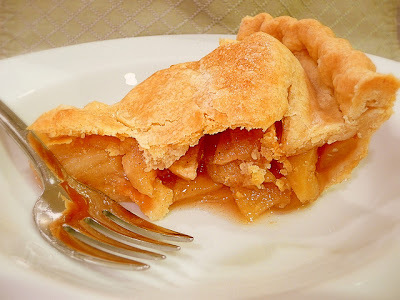 So what IS the best apple pie? If you were lucky enough to have a mom (or dad in my case) who made pies when you were a child, you'll appreciate this recipe. Hailing from the 1950s, this is as close as you can get to the actual pie that defined the saying "as American as apple pie." 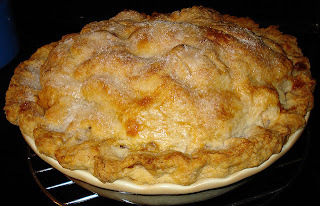 Of course everyone has their favourite, but this is about as close to a traditional, old fashioned apple pie recipe as you will ever find. This recipe is from the cookbooks my mother received shortly after she was married in 1951. It's from Meta Given's Modern Encyclopedia of Cooking, page 985. Quantities are listed for 9" and 8" pies. You also have to use the correct kind of apples. Some apples are too soft for baking. 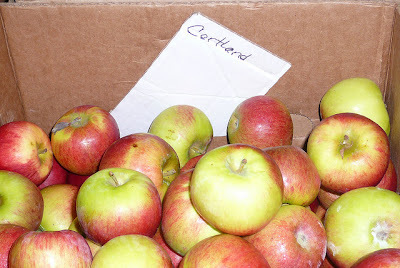 Good apples to use for pies are Cortland or Northern Spy. Use Granny Smith as a last resort. They're more tart than the other two, and will require additional sugar. Cortland apples are a good all-purpose baking apple. Combine the flour and salt in a bowl. Cut in the lard or shortening until the size of peas – no smaller. Add most of the water and mix with a fork. Add the remainder if necessary to bring it together as a shaggy dough. Do not over work, or your crust will not be flaky. Preheat the oven to 450°F. Adjust the rack to 5"-6" from the bottom. The vents you cut in the top can take many different designs. Blend the flour, salt and sugar and sprinkle 1/4 of it over the bottom of the crust. Sprinkle the remaining amount over the apples and toss. 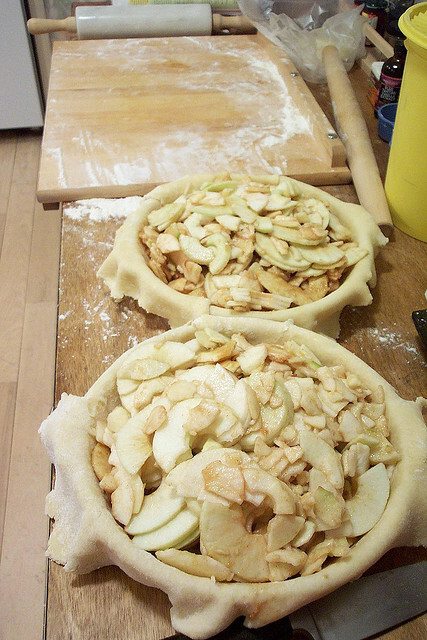 Turn the slices into the pan and arrange them to fit compactly. The fruit should be slightly mounded in the centre. Dot with the butter, and sprinkle with the lemon juice and then the cinnamon. Moisten the edge of the bottom crust with water. Place the top crust over the filling and press down along the pie plate edge. Trim off the pastry 1/2" out past the edge of the plate. Turn the overhanging pastry under the lower crust and flute the edge with your fingers to make a decorative edge. Optional: if desired, beat one egg yolk with a little cream and brush the top of the pie. Then dust with sugar before baking. Place in the oven and bake for 15 minutes. After 15 minutes, reduce the heat to 325°F and bake for 35 minutes more. Test for doneness by piercing the apples through the vents. They should be tender, but not overly soft. By this time juice should also be bubbling up through the vents. Allow to cool on a rack for 2-3 hours. Serve warm, with ice cream.